Photo Courtesy of Mark Zaleski | Associated Press. After spending eight years at Western Kentucky, including the last four as head coach, Ray Harper resigned from WKU at the end of their 2016 season. One month later, Harper was welcomed to the Jacksonville State University with open arms, hoping to revive a struggling program. Jacksonville State failed to win a game in the Ohio Valley Conference Tournament since 2012, so he immediately got to work. Harper has seen success in the past, winning the D2 National Championship twice and finishing runner up four times. He also won Division 2 Coach of the Year seven times between 1996 and 2005. To Harper, Jacksonville State was a new chapter. After garnering a losing record for the last three seasons, JSU started the season winning seven of their first ten games. They won their ninth game of the season 15 games in, already surpassing their previous season’s win total. Their season thus far, however, can be described as a resurgence, especially on the defensive end. Coach Harper had them switch to a variety of situation specific defenses throughout the OVC tournament – down by 1, down by 10, up by 5, etc. Six of their 14 losses this season were by less than 5 points, including two overtime losses. Defense has always been an emphasis in Coach Harper’s systems, and the JSU Gamecocks rank 64h in the nation in scoring defense. 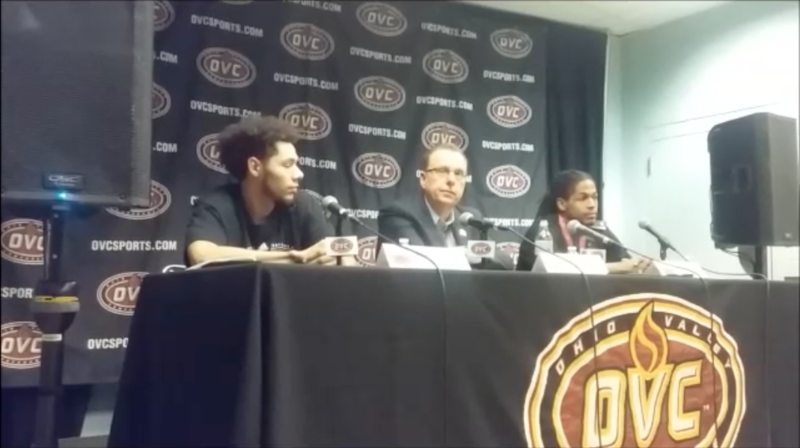 Their defense helped them upset #1 seed Belmont in the semifinals by 6 points and roll past #2 UT Austin in the finals by 11 points, winning their first ever Ohio Valley Conference Tournament. As the team heads to their first ever NCAA tournament, Coach Harper’s advice to the team is simple. “If you don’t prepare the right way leading in, you’ve got no shot.” Selection Sunday is only four days away, and while the latest First and Fan seed list rankings put them as a 16 seed right now, there’s still plenty of time for other teams to drop down the seed list and propel Jacksonville State to a higher seed. Coach Harper and the Gamecocks are definitely moving in the right direction, both this season and as a program. Check out Matt Brown of First and Fan’s postgame question to Coach Harper below.